Living Life by Design - with Alan and Mark: Spur of the Moment..... and being in the Right Place, at the Right Time! Spur of the Moment..... and being in the Right Place, at the Right Time! ......and being in the right place, at the right time! It was Sunday lunchtime, and we were having a nibble at one of our local restaurants in Elliot Lake when Mark suddenly said, 'It's so nice outside, we should be going out somewhere'. 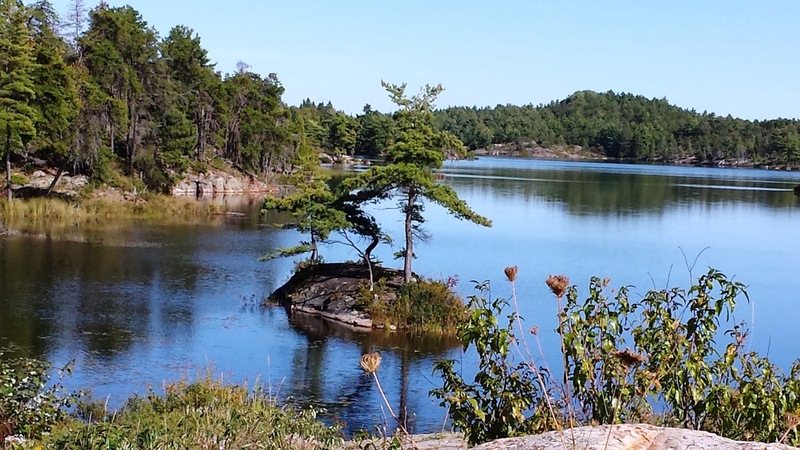 Very quickly, we fell upon the idea of visiting Manitoulin Island - something we had wanted to do ever since we moved here in June. Now, it was 2:30 p.m. and it would be at least a 2 hour drive to get to our destination, but we rolled with idea and, after a quick visit back home to collect our energy bars, snacks, and water, we set off. It occurred to me that freedom of time which comes along with retirement is a wonderful thing. I knew that I didn't have to get to bed at a 'reasonable time' because I didn't have to get up early for work the next morning. After all, this was a Sunday! We just did it! The journey to Espanola is familiar to us, having done it several times over the last three months. However, when we headed south of there on Highway 6, the scenery completely changed. Rocks plunging into lakes at various angles merged with large open spaces giving us a variety of vistas to enjoy along the way. 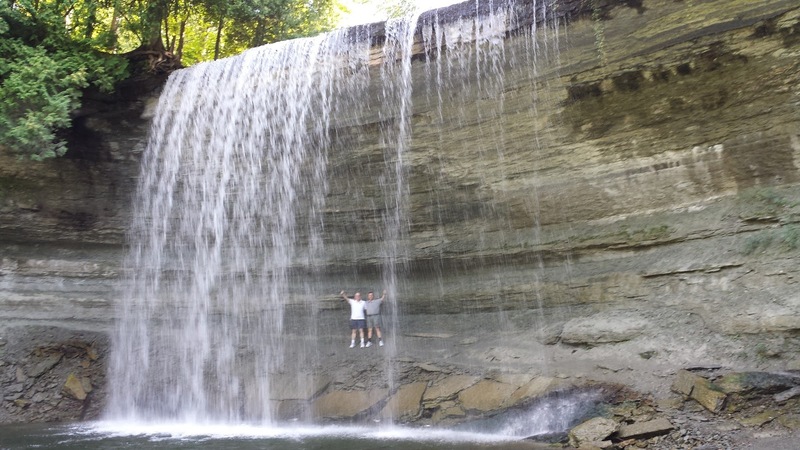 Manitoulin is quite a large island, and so we had chosen a particular destination: Bridal Veil Falls. Ever since we had heard about it from those who had been there, it had been placed on our ever-increasing bucket list. 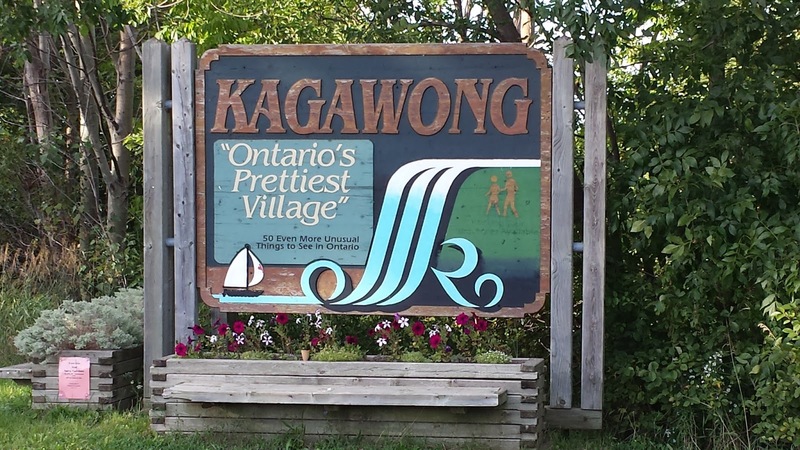 We were not prepared for just how beautiful it was..... and the small village of Kagawong certainly lives up to its welcome sign: 'Ontario's Prettiest Village'. This was to be the first time that we had actually been behind a waterfall and it was amazing - a very different perspective. Although the water was a little cool, if we would have had our bathing costumes, in we would have gone! On the way back, we witnessed a spectacular sunset - one of those where the cloud formations just add to the overall effect. While stopping to take photos, we noticed a field with hundreds of sandhill cranes milling about. As we moved closer, they began to make noises which are now familiar to us (reminiscent of the veloceraptors in Jurassic Park!) and then took off in flight. Luckily, we had our phone in movie mode and we were able to capture them as they flew right in front of the setting sun! It was a magical moment. We didn't get back to Elliot Lake until 11:30, and Mark was adamant in his desire to download all of the photos and get them posted on Facebook. So, we didn't get to bed until gone 2:00 a.m. - which didn't matter - because it doesn't matter any more!!! As has been said by so many people, it is the unplanned events that sometimes bring the most joy. Our spur of the moment decision on Sunday was one of those occasions!